Mozambique and a handful of other countries have chosen weapons as a symbol of their national identity. The AK-47 has been a part of the Mozambican flag since 1975. 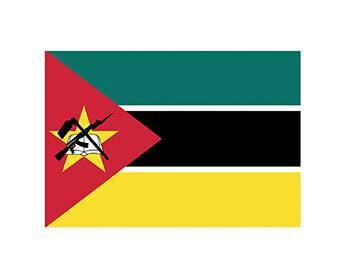 (The current design was adopted on 1 May 1983, and bears close resemblance to a FRELIMO flag.) FRELIMO, which led the war for Mozambique's freedom with AK-47s, has been the ruling party post-independence till today. In 2005, the government initiated (with a push from RENAMO) a public competition to redesign the country's flag, especially to take down the gun from it. While allowing leeway for creativity, the submissions were mandated to incorporate the following themes in the design: the blood shed in the struggle for independence, national unity, peace, democracy and social justice, and the country's wealth. A jury was appointed, 169 entries were received and a winner was chosen.